Design Indaba worked with stakeholders including SeeSawDo on two projects giving a second life to the Embrace the Unknown installation. For years, Bongolethu Primary has had a space set aside for a library but it was mainly used for storage, as the books, resources, and training needed to run a functioning library was too expensive for the school to afford. With the help and resources from the Kamvalethu Foundation, The Bookery, and SeeSawDo - as well as the vibrantly coloured panels from award-winning British designer Morag Myerscough's installation - the space was transformed into an inviting hideaway where the school’s children can come to learn, research, or simply get lost in the magical world of books. 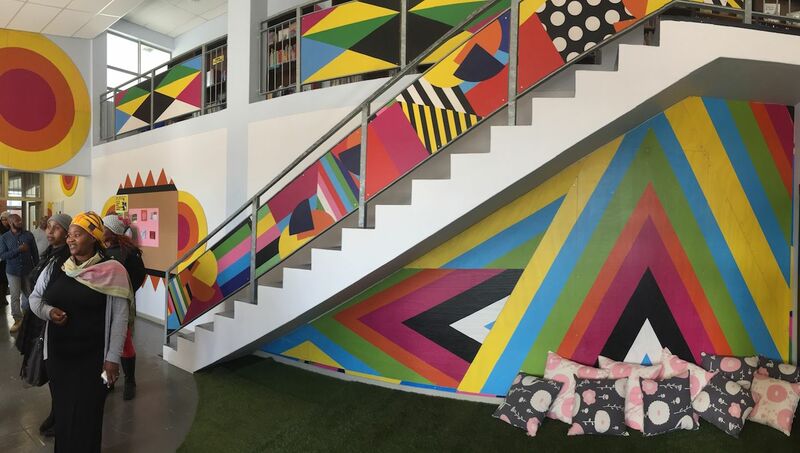 The panels were part of a colourful installation, titled Embrace The Unknown (below), that Myerscough created for this year's Design Indaba. The Artscape Theatre Centre piazza came alive with colour as visitors embranced the installation which included swings, slides and areas where people could relax. 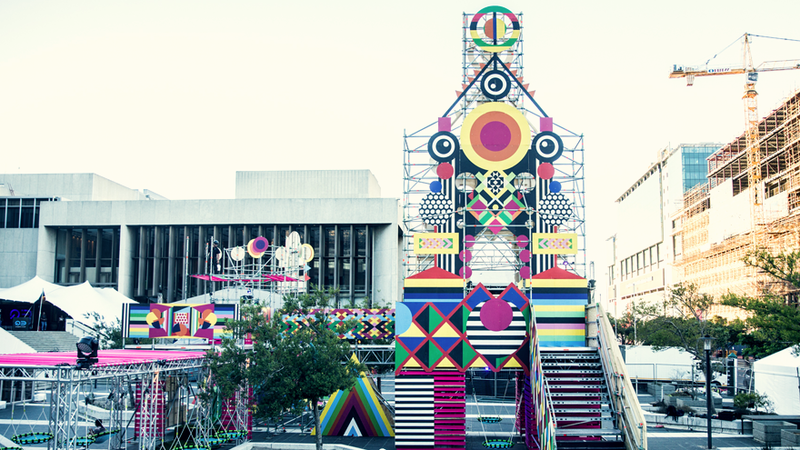 When the festival ended and keeping in step with the theme of the work, we partnered with multidisciplinary design studio SeeSawDo to find projects around Cape Town where the installation can have a second life and inspire the next generation. 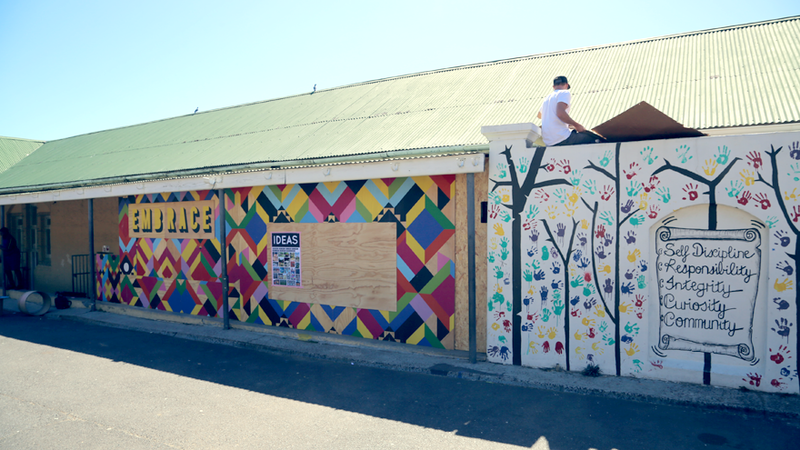 The installation’s deconstruction led to some of the panels being donated to Zonnebloem Primary, where a handful of Myerscough’s digitally-printed wooden sheets were installed alongside the school's central quad to generate some excitement visually and serves as the start of a long-term revamp initiative for the area (below). This month, more of the panels were used to help refurbish the library at Bongolethu Primary School outside Nyanga. 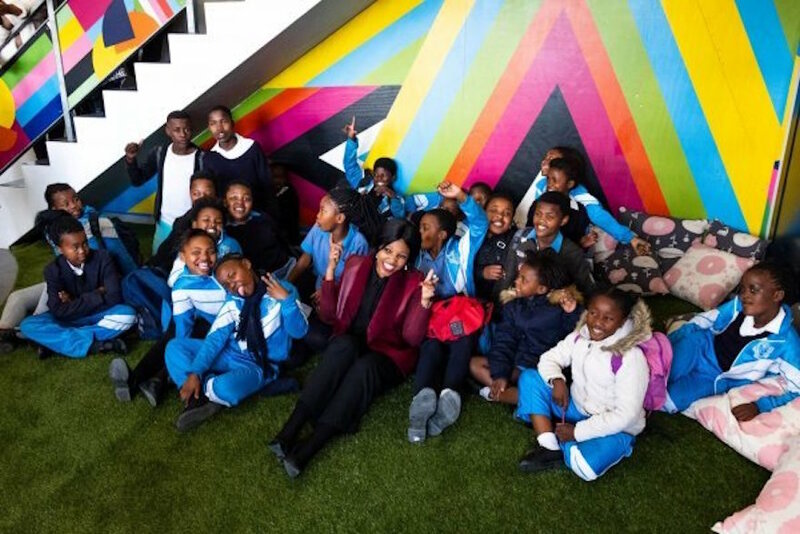 An NPO focused on advancing the quality of youth education in under resourced communities, the Kamvalethu Foundation have been working with Bongolethu Primary School since 2015. About 78% of South Africa’s Grade 4 learners are unable to read for meaning and do not have access to reading material from an early age. Access to reading material is therefore crucial in ensuring the best outcomes when it comes to learners’ development. During the library's unveiling ceremony held on 1 August, Principal Halbert Mlindazwe expressed his gratitude to the many individuals who have worked on making the new library a reality. Representatives from Kamvalethu, The Bookery and SeeSawDo were all present, as well as many of the school’s teachers. After some entertainment from the Bongolethu learners, the ribbon was officially cut by Kamvalethu Chairman, Rowan Haarhoff, and Mlindazwe. Bursting with colour, the new space is filled with light and features walls lined with packed bookshelves. Brightly painted tables and chairs where kids can work or play scatter the first floor and a large patch of artificial grass serves as a gathering spot in the centre. Upstairs, more books can be found, while enclosed nooks filled with comfy cushions provide a more secluded area for children to read. Read more on innovation and design for social causes.